Definition at line 39 of file cs-policy.hpp. Definition at line 62 of file cs-policy.cpp. Definition at line 44 of file cs-policy.hpp. Definition at line 46 of file cs-policy.cpp. Definition at line 54 of file cs-policy.cpp. Definition at line 193 of file cs-policy.hpp. Definition at line 199 of file cs-policy.hpp. Definition at line 205 of file cs-policy.hpp. Definition at line 211 of file cs-policy.hpp. The policy may evict entries if necessary. Definition at line 68 of file cs-policy.cpp. The policy may evict entries if necessary. During this process, i might be evicted. Definition at line 76 of file cs-policy.cpp. The policy may witness this refresh to make better eviction decisions in the future. Definition at line 83 of file cs-policy.cpp. CS must not invoke this method if an entry is erased due to eviction. Definition at line 90 of file cs-policy.cpp. The policy may witness this usage to make better eviction decisions in the future. Definition at line 97 of file cs-policy.cpp. 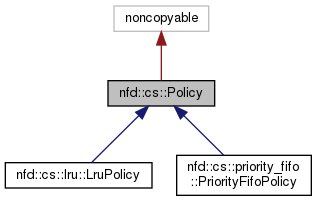 When overridden in a subclass, a policy implementation should decide whether to accept i. If i is accepted, it should be inserted into a cleanup index. Otherwise, beforeEvict signal should be emitted with i to inform CS to erase the entry. 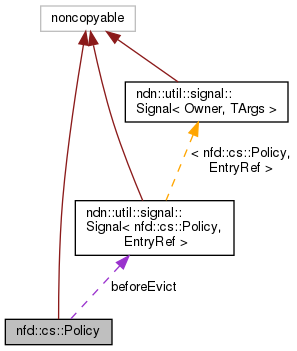 A policy implementation may decide to evict other entries by emitting beforeEvict signal, in order to keep CS size under limit. When overridden in a subclass, a policy implementation may witness this operation and adjust its cleanup index. This will not be invoked for an entry being evicted by policy. When overridden in a subclass, a policy implementation should erase i from its cleanup index without emitted afterErase signal. A policy implementation should emit this signal to cause CS to erase the entry from its index. CS should connect to this signal and erase the entry upon signal emission. Definition at line 102 of file cs-policy.hpp.